A US-Chinese military conflict would be on top of a vow by Trump in his inaugural presidential address, to not only take on radical Islamic terrorism, but to “eradicate it from the face of the Earth.” This would be done by building up America’s already supreme military. “Our military dominance must be unquestioned,” the billionaire businessman, who now controlled the most powerful political office in the world, declared in his first address to the nation. A year and a half after that speech, the United States is not at war with China, but it’s economic saber-rattling is arguably the beginning of a confrontation between the world’s largest and second-largest economies. Trump’s tariff threats against not only China but Europe, Canada, Mexico and its other trade partners, are also symbolic of a shift in US foreign policy towards a more isolationist stance - one that may not strictly be due to Trump’s belligerent personality. This article will get into the antecedents of this economic and military showdown and point the way to some possible future scenarios, including a war in space. Trump has had China in his sights since he first set out on the campaign trail in 2016. He called China a currency manipulator, by unfairly setting the value of the yuan, or renmimbi, too low, allowing cheap imports into the US and making American goods uncompetitive. While the president has since backed off that stance, his administration switched tactics in March when the Commerce Department announced cross-the-board tariffs on steel and aluminum – an indirect jab at China for flooding the global market with cheap steel. The Chinese immediately respond with $3 billion worth of countervailing duties. Trump threatened 25% tariffs on $50 billion in Chinese technology products, which was met by an equal $50 billion in tariffs on US exports to China including cars, aircraft and agricultural products. The trade spat escalated into $150 billion worth of tariff threats from either side. While many expressed surprise at what the press quickly termed a “trade war”, Trump claimed it’s been going on for decades and has resulted in lost American jobs, a trade deficit with China last calculated at $375 billion, and the theft of US intellectual property, which American companies must hand over as a condition of access to the 1.3 billion population Chinese market. For several weeks the threats were just that, but now the trade war is real. On June 15 Trump announced a 25% tariff on $50 billion worth of Chinese goods, prompting China to retaliate with a similar-sized set of levies, including on US produce, cars and seafood. The States is expected to impose tariffs on $34 billion of Chinese imports starting July 6. If the threat is realized, economists say it could cut half a percentage point off China’s economic growth. The US and the EU have also imposed tariffs against one another. The Treasury Department is expected to release new rules on Chinese investment in technology companies - a bee in the US’s bonnet. Bloomberg reminds us the White House has issued a 36-page report accusing China of “economic aggression”, and cites a decision to penalize ZTE Corp, which makes telecommunications equipment, for violating Iran nuclear sanctions. A great example of Trump’s complaint is China’s newest military aircraft, the J-31 fighter. In 2001 the Pentagon awarded US defense contractor Lockheed Martin a $200 billion contract to build the F-35 Joint Strike Fighter. Eight years later, as CNBC reports, the design and electronics data were believed to be compromised - stolen by Chinese hackers. Now, both the Shenyang J-31 jet and the Chengdu J-20 stealth fighter look similar to the designs of the Lockheed Martin planes. On the Chinese side, Trump’s bluster is alarming to Chinese officials who are scrambling to figure out the best way to deal with him. Bloomberg points out that some in the foreign ministry are questioning whether Beijing has the might and the stomach for a trade war with the US. Perceptions aside, the trade war is having a negative impact on both economies. The Dow plunged over 400 points and the S&P fell to its lowest level since May. Chinese stocks headed into bear market territory, and the value of the yuan extended previous declines, hitting a 6-month low. While Trump sees the trade restrictions against China as a long-overdue rebalancing of unfair trade practices, China and the EU have publicly opposed US unilateralism and protectionism, warning that it could lead to a global recession. 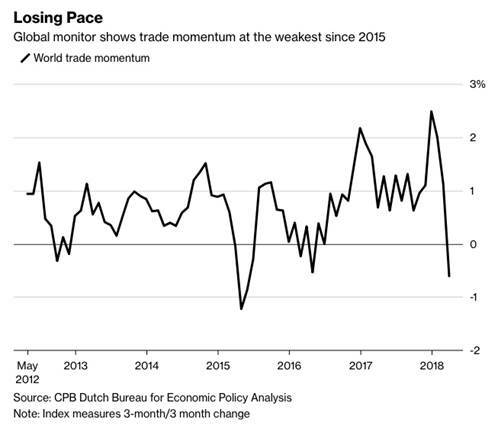 World trade momentum dropped in April to its lowest since 2015; the graph below shows a sharp decline since the trade monitor by the Dutch Bureau for Economic Policy Analysis hit a seven-year high in January. Since Trump became president he has taken an 180-degree turn from presidents before him, most starkly Obama who was a globalist, a liberal and a free-trader. It was Trump’s nationalist, populist persona that won him support among his base and convinced moderates he was a better choice for president than Hillary Clinton. William Huggins, lecturer at McMaster University in Ontario, recently made a video for the Financial Post in which he explains America’s strategy of disengagement with the rest of the world under the leadership of Donald Trump. In exchange for their deference on security matters, nations of Eurasia not in the Soviet bloc were bought off economically through favorable trade arrangements that allowed them to export their way to prosperity. Effectively American guns sheltered the redevelopment of shattered nations while providing strong economic life support so that strong Allied powers could emerge at either ends of the continent to keep the Russians in Russia. America continued to provide free security to all seaborne trade, contributed the lion’s share to organizations like the UN, IMF and NATO, and tolerated significant non-tariff barriers to its own exports among its economic allies. Up to 2016, institutional momentum helped to sustain the status quo. But over time America’s needs changed. It found its prior arrangements were constraining its strengths, and enabling its rivals. The justification for the expense of old systems simply didn’t exist anymore. When confronted with economic challenges at home, America has been poised for a rebalancing of its international relations for some time. Without a security concern to align the national self interests of the system’s cornerstone with its junior partners, it’s difficult to justify the economic costs of sustaining it, regardless of who the president might be… While it may prefer isolationism to leadership, the US will remain the central player to security and economics, for generations to come. The characterization of Trump as an isolationist is not new. Since his presidency began many commentators have noticed similarities between his “America First” foreign policy and the “interventionists” of the 1930s, who wanted to stay neutral and keep the United States out of the looming world war. The left-leaning Huffington Post snorted indignation at Trump giving the middle finger to America’s allies in a recent editorial by Richard North Patterson, a best-selling author and member of the Council of Foreign Relations. “A leader ignorant of history misapprehends its tragedies. A president steeped in grandiosity risks repeating them. Such is Donald Trump,” Patterson begins - referencing Trump’s ignorance of how nationalism combined with failed diplomacy led to two world wars and the 40-year stand-off between the US and the Soviet Union. “Armed with bluster untethered to reality, Trump disparages allies, praises dictators, invokes protectionism, rejects agreements to protect the environment or promote trade, spurns refugees from carnage, rewrites immigration policies to keep America white and assaults global institutions of America’s own making,” Patterson states, echoing liberals everywhere. “He uses the world as a soundstage for braggadocio unmoored from reason – provoking a contempt he is incapable of perceiving. Suffusing these behaviors is a stunning inversion of wise diplomacy. Quiet persistence, not noisy threats, cements enduring progress,” he concludes. The Washington Post, owned by Trump’s nemesis, Amazon CEO Jeff Bezos, goes a step further, saying the term isolationist isn’t an accurate description of Trump. Facing a vicious world, Trump promises to turn the tables, not turn his back. He talks of grabbing wealth from other countries, most vividly in his mantra to “take the oil” in Iraq. “Maybe we’ll have another chance,” he said in a speech at the CIA. Trump may be posturing, but the posture is militaristic. To announce a lust for oil, to chest-thump about torture, to envisage military parades down Pennsylvania Avenue — these do not achieve strategic objectives so much as exalt brute force. “I’m the most militaristic person there is,” Trump said in the primaries. Perhaps he was telling the truth. Trump’s cultural militarism bears watching, even if it never translates into foreign policy. Drawing a moral equivalence between the United States and Vladimir Putin’s Russia, Trump rejects America’s traditional identity as an exceptional nation shining the light of freedom to the world. What identity does he offer instead? While ignoring the Founding Fathers, he constantly invokes the “old days of General MacArthur and General Patton,” the most extreme generals of the mid-20th century. In Trump’s imagination, the generals demanded absolute victory, ensuring that “we never lost a war” before Vietnam. Trump’s mythologizing recalls the veneration that imperial Germany bestowed upon its army, which had forged the nation by defeating France in 1871. MacArthur and Patton are Trump’s new founders. In explaining an increasingly isolated US under Trump, Prof. Huggins is wrong about one important fact. The Cold War downgraded Russian military power (contrary to what many believe, Russia is not much of a threat to the US - its economy, wholly dependent on oil exports, is around the size of France, and its military equipment is old and no match for superior US technology), but it also allowed for a new player to take its place: China. Obama’s pivot to Asia, to be realized through increased trade like the Trans Pacific Partnership (TPP) and increasing its regional military profile, was a failure. The US could not prevent China from annexing 80% of the South China Sea, defend freedom of navigation through the $5-trillion annual maritime trade corridor, or stop China-backed North Korea from conducting nuclear tests. On assuming power Trump pulled the US out of the TPP and began a dangerous war of words with North Korea’s Kim Jong-un as the reclusive nation successfully tested its first intercontinental ballistic missile capable of hitting the US mainland. China is a close ally of North Korea. Meanwhile China continues to expand its military. In early March it was reported that China plans to boost military spending by 8.1% in 2018, compared to a 7% increase in 2017. Recent maneuvers in the South China Sea demonstrate that Beijing is willing to flex its muscles in a region it sees as strategically and economically important. China has also projected economic power through a series of mineral and oil acquisitions in Africa, Canada, the US, Australia and Latin America. The reason, of course, is to feed China’s insatiable appetite for commodities. As an example, the Chinese are both the largest producers and consumers of aluminum and iron ore. The enormous political, economic and cultural shift in China, from a developing agrarian society to a modern, urban one, has led to some remarkable developments, all of which are good for commodities. Belt and Road is a $900 billion initiative meant to open channels between China and its neighbors, mostly through infrastructure investments. China long ago put a lock on much of Africa’s vast resources. More recently the most desired metals are those that feed into a tectonic global shift from fossil fuels to the electrification of vehicles. This has meant a hunt for lithium, cobalt, graphite, copper and rare earths - metals that are used in electric vehicles, of which China has become the world leader. The most interesting part of this trend is not that China is acquiring mines and mining company stakes abroad - that has been going on for at least a decade - but that the overt attempts to lock up the world’s mining and energy resources, some of which are critical to the future world economy, are happening under the nose of the United States in Latin America, in countries previously subject to the Monroe Doctrine and in one case, right in their own front yard. Recognizing the weakness of Russia and the Kremlin’s need to expand its influence in the face of US dominance, China and Russia have grown closer. On New Year’s Day a second Sino-Russian oil pipeline began operating, doubling the amount of Russian crude being shipped to China, while in 2014 Beijing and Moscow signed a 30-year, $400-billion deal for Gazprom to deliver gas to China. Last summer Xi Jinping and Vladimir Putin met in Russia to sign a deal whereby two Russian banks and a Chinese bank created a $10-billion investment fund that will finance infrastructure and development projects, and an $850 million innovation fund. The Russian banks are subject to US sanctions so the deal allows Russia to access non-Western capital, and to conduct transactions in yuan or rubles. The latest evidence of Chinese-Russian business ties involves a new crude oil futures contract, priced in yuan and convertible into gold. The Shanghai-based contract will allow oil exporters like Russia and Iran to dodge US sanctions against them by trading oil in yuan rather than US dollars. Most recently, China has reacted to US protectionism by reaching out to Europe. Bloomberg reported earlier this week that China and Europe agreed to oppose protectionism and defend the multilateral trading system, as stated by President Xi Jinpeng’s top economic advisor, Vice Premier Liu He. More concretely, last year German President Angela Merkel said she wants quick progress on a China-EU investment deal, and pointed to an agreement between Daimler and BAIC Motor Corporation to upgrade a Mercedes-Benz factory in Beijing, as an example of cooperation. China was Germany’s most important trading partner in 2017, with bilateral trade of 186 billion euros. How would China fare in a shooting war against the United States? Despite recent attempts to modernize its military, the answer is it probably wouldn’t go well for the Chinese. To beat the United States, China would have to project its military power, and it's currently unable to do that. China has one aircraft carrier, the United States Military has 19. While the Chinese increased military spending by 8% this year, it's a drop in the bucket compared to what the US spends and the military equipment it has at its disposal. In 2016 the US spent $611 billion – the most of any country by far. The next closest was China at about a third, or $215 billion. China's military spending is 1.9% of GDP compared to 3.3% in the US; Russia's is 5.3%, but it only spent $69.2 billion in 2016 – a tenth of US expenditures. The United States maintains 800 military bases in over 70 countries, compared with 30 between Britain, France and Russia combined. China just opened its first one, in Djibouti. But we shouldn’t limit such comparisons to Earth. There is growing evidence of a space race heating up - not the one we’re used to, where nations shoot off rockets to demonstrate how far they can travel into the universe - but rather, a competition for the capability to destroy satellites. Eleven years ago the Chinese made headlines when they managed to use a rocket to blow up one of their own satellites. The fact that China had proven it could launch a rocket from the ground and hit a target moving at 17,000 mph was remarkable - but dangerous. What could this mean for the security of satellites, which the world depends on for conveying so much of current telecommunications including global positioning systems? When Americans elected Trump in November 2016, they must have known that things would different. Never before has the US seen this kind of President - one who tweets from the hip, cares little for diplomacy, sees every interaction as a business deal, likes being politically incorrect, and prefers confrontation over cooperation. They probably hadn’t counted on a president who would up-end the global economic and geopolitical order all in the cause of “Making America Great Again”. To Trump and his Administration, the new world order isn’t globalism, it’s unilateralism. The enemy isn’t Russia, it’s China. And Islamic fundamentalists. A strong America doesn’t need allies. We are on the road to war with China. 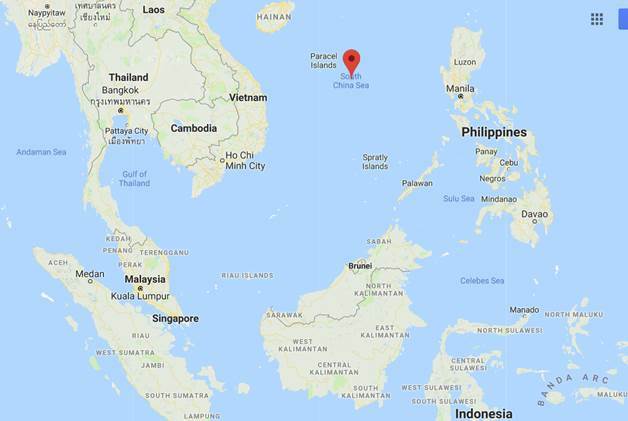 It may not be a military confrontation, although that is highly likely considering tensions in the South China Sea - but it is certainly economic. 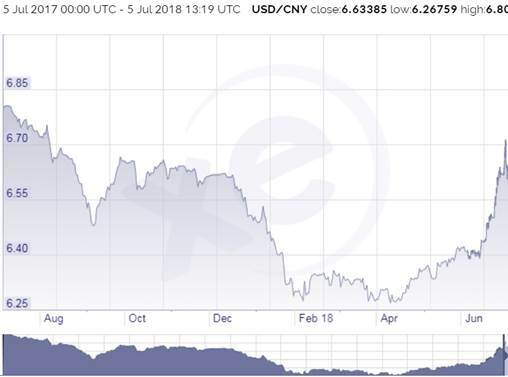 Will China back down, as Trump continues to pile on tariffs? Or is saving face more important than a dip in economic growth? In the end it will be American voters that decide whether beating China is worth higher prices of goods that have been cheap for decades. The mid-term elections are coming up in November, so that will be a good indication of whether Trump is on track with his fellow Americans, or leading a cause that few want to get behind. Is war between the US and China on your radar screen? If not, perhaps it should be.